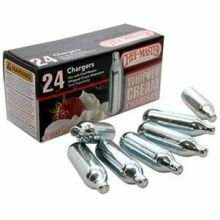 Chef Master N20 Whipped Cream Chargers -- 600 per case. For use with Chef-Master Whipped Cream Dispensers (sold separately). Use these N2O cartridges with your 1/2 and 1 liter cream whippers / dispensers to make whipped cream, mousse, cold dessert toppings, and other delectable desserts.